I found this package of "curry flavored dried beef" while perusing through a 99 Ranch Market one day. 99 Ranch Market specializes in Chinese groceries. This particular dried meat snack is produced by DC China Meat Products, out of Montclair, CA. They have their own meat processing facility. Having grown up with a Japanese mother, I've been to several asian food stores and have seen stuff like this before, but I've never bothered with it until now. Actually, "curry flavored" jerky sounds very tempting to me. The Japanese and Chinese are curry fanatics if you didn't already know. It's typical to see curry-flavored everything in their processed foods. In the photos below, notice that this jerky is encrusted with furry meat fibers. It's a "furry curry jerky". These loose fibers are infused with spicy curry seasoning, and then adhered to the meat pieces. This is also very typical of asian style jerky. Beef, soy sauce, sugar, salt, wine, monosodium glutamate, curry powder (spices, tumeric, salt, chili pepper, natural flavor), vinegar, spices, sodium nitrite. The tastes that I pick up from the surface of these pieces is a strong curry flavor, which is mostly that tumeric, followed quickly by a spicy tingle brewing on the back of my mouth. I can also pick up a sweetness back there too. Moving into the chewing, I taste the natural meat flavors, and some of the saltiness. Sucking out some of the juices, I can detect a slight bit of soy sauce. Curry flavored this definitely is. It seems to taste more like an Indian style curry than the Japanese or Chinese style. The tumeric flavor is very strong. It's also got a pronounced sweetness in there. 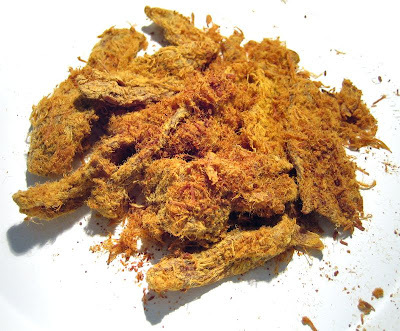 The tumeric and sugar actually combine pretty well to make a tasty jerky seasoning unlike much of what you'd find in stores. It's also got a spicy bite to it, which I'd rate as medium on my scale. I can even taste a slight bit of the chili pepper taste. The natural meat flavors have a moderate showing. I can definitely taste it, but it doesn't overpower this jerky. This seems to be a jerky that you'd enjoy for the seasonings than the meat. Salt-wise, I don't really see this as "too salty", it's actually moderate. 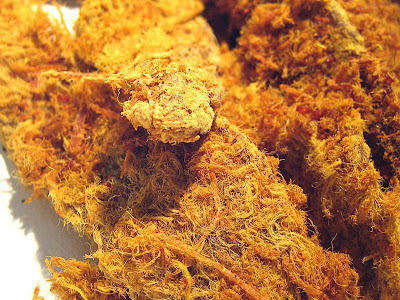 The primary taste of this jerky is that tumeric-curry flavor, with the sweet coming in second, and the natural meat flavors third. Overall, it's a great tasting jerky if you enjoy spicy-sweet curry. It's also strong on flavor, so expect to get a decent burst from each piece. These appear to be slices of whole meat, sliced average thickness, in small pieces. Note that I bought the smaller 1.5 ounce package which is too small to contain anything larger. This is a dry jerky, but still very flexible. I can bend it all the way around and it won't break. But it's very easy to tear apart with the grain, and also very easy to tear against the grain. Most of the pieces are bite-sized anyways. It chews very easily too, it almost falls apart in my mouth. And it also has a very steak-like chewing experience too. In terms of cleanliness, those tiny furry meat fibers tend to remain on my fingers, and it will fall on my lap. But it's a very lean jerky, I find no fat, no tendon, no gristle. I paid $1.69 for the 1.5 ounce bag at a 99 Ranch Market in Irvine, CA. That works out to a price of $1.13 per ounce, making this an average priced jerky, but on the lower end towards cheap. For general jerky snacking purposes, this has an excellent value. I found this to be highly snackable with its strong and tasty flavor, and easy-to-eat meat consistency. The fact that it was priced on the lower end, with it's delicious flavor, you can't go wrong buying this. As a curry flavored jerky, it's another great value, because you're getting plenty of curry flavor at a price that's lower than most jerkies on the market. I really liked the spicy-sweet curry flavor in this, and I found the meat consistency to be excellent in terms of ease in eating, and chewing experience. There's a level of flavor complexity in this with the tumeric, sweet, spiciness, meat flavors, and some hints of soy sauce and chili pepper. If you were to talk to a Chinese or Japanese person who eats asian-style jerky all the time, this stuff might actually taste average to them. But for someone like me who eats mostly American-style jerky, this is a very welcome change of pace. I tried my best to evaluate this jerky on its own merits, noting only what I perceive as factual, and not necessarily through my excitement of something different. If you can find this at a Chinese food store, definitely try it out. I think a good beer with this is a wheat beer, or hefeweizen.